With the new year right around the corner, you might be thinking about resolutions you plan to have for 2017. I know I have, but resolutions can be hard. So many people, myself included, make a list of resolutions and they work hard at them for the first few weeks. Then once the end of January hits, we go back to our old ways. That is why instead of resolutions, this year, you should set goals. Goals are much less stressful, because they can be achieved gradually. You can make smaller changes each week or month that lead to big changes down the road. You wouldn’t go straight from eating hamburgers on the reg to being a vegan, would you? So, this year, make a list of goals. 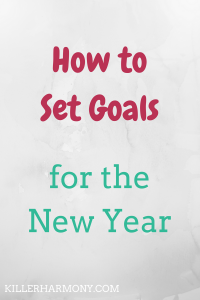 This post will help you set those goals. When making a goal, you want to think of the acronym SMART. This stands for Specific Meaningful Attainable Relevant and Time-based. There are other ways you can spell out the word SMART, and you can search online for those different ways. Find what works for you. Either way, you wan to be specific, interested and motivated to achieve your goal. Don’t make too many goals. It can be tempting to set goals for every part of your life, but that would get confusing. You should only set a few main goals at a time. When you achieve one goal, set another. That way, you are always working toward something but aren’t getting too overwhelmed. Since I graduate college in May, my goals will be centered around finishing school and starting my career. I might throw a personal goal in there, but school and my business will be my biggest priorities. With any major project, it can be difficult to achieve a huge life goal. After you set a big goal, think about the different steps it will take and how you can break your goal into separate parts. This makes it more manageable, and you can see a bit of success sooner rather than later. If your goal is to get all A’s next semester, your “mini” goals could include studying a week before each test, spending x amount of time outside of class on assignments or going to office hours regularly for help. Maybe your goal is to cut out junk food. Your “mini” goals could include eating at home all but once per week, only buying preportioned snacks or learning to cook healthier meals. Some people like to put sticky notes on their mirror with their goal written down. Other people might prefer to set notifications on their phone. Reminding yourself of your goal on a regular basis means that you will be thinking about it. You can also create reminders of where you were at the start. If your goal is to walk more, use a step tracker and look back at the first few days. Reminding yourself of where you have been and where you are going is a great way to stay motivated. Ask a friend or family member to help you stay accountable to your goals. It can be easy to slack off on something that will only affect us, but others is a different story. Telling a friend or family member means that you have more of a reason to keep up with your goal. You have told someone about what you hope to achieve. It’s much more difficult to back down from something when you have talked about it with others. You can even hold your friend accountable for a goal they have. It can also be motivating to talk about your milestones. An accountability partner makes a great cheerleader! So, have you set goals before? What did you do to achieve them? Let me know in the comments. Also, be sure to read my previous post and follow me on Twitter (@HannahHaefele) so you don’t miss future posts! Finally, download my goal planning sheet so that you can get a head start on your goals for the year!